Is your kid “All Fired Up?” If yes, you probably need a little redecoration in his room to pacify his craving for a Skylanders themed bedroom. The 10 year old kid in my neighborhood is always found sitting in front of the TV, playing Skylanders video game on his Xbox. Critics suggest that Skylanders can become a parent’s worst nightmare because all kids are badly addicted to this one-of-a-kind game that aims at erasing the line between a toy and a video game. But you can help your kid through this addiction by replacing a few things in his room with the products featured below so that whenever your little one is not playing the game, he can still feel surrounded by his favorite Skylanders characters in his bedroom. 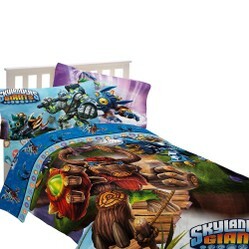 The full of life Energy Conquers bed set features The Skylanders Giants in action against KAOS. 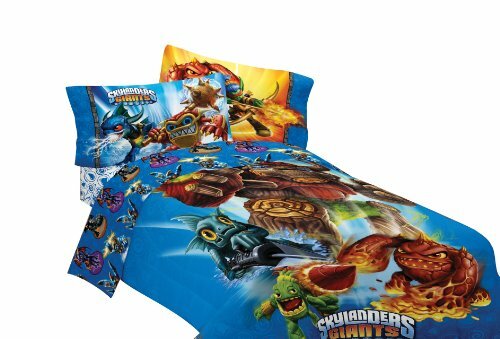 The set comprises of two standard pillow cases showing some of the famous characters like Gill Grunt on the front, a vibrant and colorful bedskirt and a comforter featuring the Skylanders Giants fighting to defeat the KAOS. 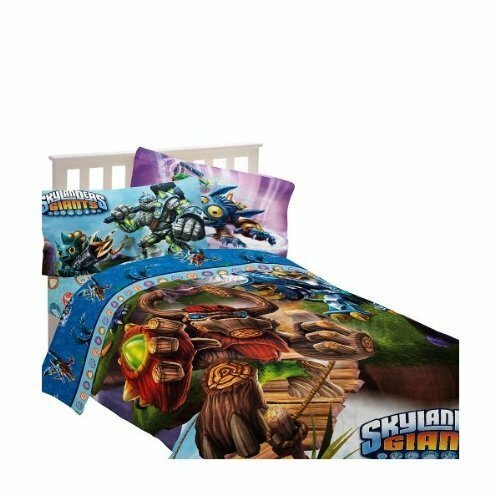 The Skylanders Sky Friends microfiber comforter will probably make the best choice for your kid’s bed. Featuring the most popular Skylanders character Spyro, and some of his friends, this cozy comforter will make your kid want to cuddle in it all day long. It can also be flipped over to show off some other props from the game and make your kid feel excited every time the comforter is reversed. These bed sets are all dynamic and colorful to make your kid’s bedroom look livelier than before. If the weather gets chilly and your kid feels a little too cold, you might probably want him to cuddle in a warm and cozy blanket with a cup of hot chocolate and some dried nuts to enjoy the cool atmosphere. 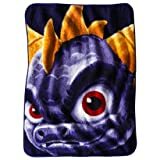 This fiery Skylander Gaming Monster microraschel blanket features “Eruptor,” the lava-breathing monster; the perfect character for a blanket, to make a cozy and warm feeling. 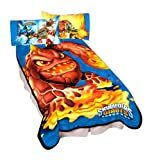 As its tagline suggests, the Skylanders Spyro’s Adventures shows off Spyro in the Portal of Power with a lively duvet cover showcasing Spyro with his friends, and, a pillow cover with a Skylanders character. If your kid is the only one in your family, this ensemble is perfect for your kid. I have seen a lot of kids carrying stuffed pillows of their favorite characters from different cartoon series and games. Kids are attracted towards such pillows as they are fun to sleep on and make great toys to play with too. This implies to the Skylanders Giants Magic Spyro throw and pillow set. This set features an 11 inch stuffed Spyro figure holding a rolled 40”x50” plush throw. The stuffed Spyro figure makes both a pillow and a toy whereas the plush throw is all warm and cuddly to slip in and sleep. 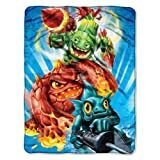 The Skylanders Giants microraschel throw measures 46”x60” and shows some of the Skylanders characters in action on a bright blue background. The kid in my neighborhood loves the Skylanders giants canvas tote and throw set in his bedroom. The set includes a canvas tote measuring 12”x14” which holds a polyester throw measuring 40”x50”. The tote is a Spyro look-alike and the throw features a Spyro close-up. The attractive set has a gift tag attached to it giving it a gift bag look. Despite of their rooms’ walls already filled up with giant-sized posters, my younger brother and both of my nieces are always asking for more posters of their favorite characters from different games and movies. And not only kids, teens and adults are addicted to such posters too. For a themed bedroom, these wall decals will charge the ambiance and make the kids’ personal space an attraction for all. The Skylanders group video game posters come in different sizes. One of these posters features almost all of the characters in the video game on a dark background and measures 22”x34”. The other one features the Skylanders Giants on a bright blue background and measures 36”x24”. Another one shows off Skylanders Spyro’s Adventure characters in a grid on a dusky background and measures 22”x34”. All of these wall decals can be framed to put up on a wall and can also be sent as gifts to friends. Yes, computer games can be addictive. I wonder how parents deal with this issue. It's hard to pull your kid away to something else when these games are so beguiling. Limiting computer time can leave the kid rather frustrated, so maybe having these bedding sets will leave the kid playing the game in his imagination part of the time, which may be better, cause thankfully the mind does wander.